Dill reminds me of a rebellious teenager who just wants to be loved but doesn’t know how to let that happen. Dill loves to walk and we do so 2-3 times a day. Morning and night (45mins minimum/walk) with either a lunchtime run around or walk. With this schedule, he stays pretty calm the rest of the day and is a super manageable dog. He is even getting used to spending more daytime hours in the kennel to open him up to an adopter who works a 9-5. 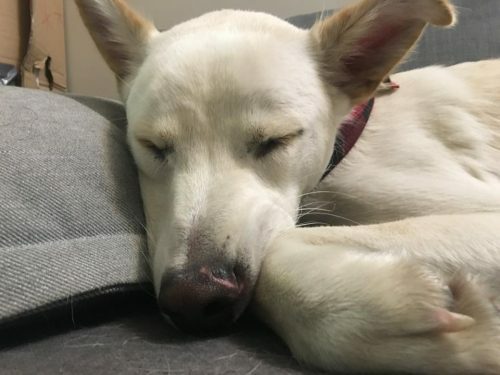 (He is not quite there yet, and will need a bit of time for this) Dill 100% needs a furever human who loves the outdoors and is committed to walking and/or running a minimum of twice a day, and either coming home at lunch or providing a dog walker during the day. He would thrive though with a furever human who works from home or has someone in the house who works part time and can be home with him. He’s super smart, and is learning commands, and tricks very quickly. We are still working on his recall, but he’s got sit and lay-down mastered, and is getting better and better a shake-a-paw, and “touch”. Dill likes some background noise to fall asleep to, especially the comedic stylings of Tig Nataro playlists on Spotify. I think my place is a bit too quiet for what he’s used to. He loves puzzle games, like ‘Find the toy’ or the meal time ball that he has to push around to get his food out of. 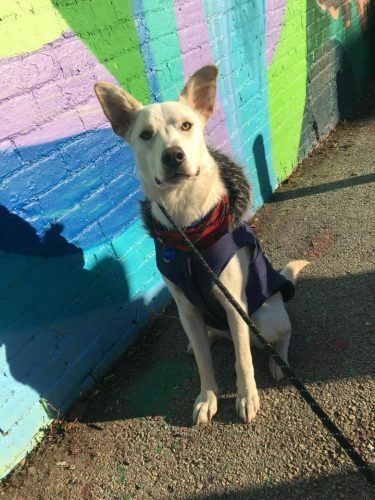 A furever human who understands puzzle games and mental stimulation for a dog would be great! Dill enthusiastically wants to say hello to a lot of dogs on walks which we are working on (and is improving), and will chase squirrels and cats in the backyard. If a dog makes a move of dominance/aggression towards Dill (or Jefferson) on a walk, he will lunge a bit, but that has been happening less and less as we’ve been working on it. Deep down, (not even that deep) Dill is a VERY good boy. He’s quickly learning that good attention is different, and better than bad attention, and what it takes to get good attention. 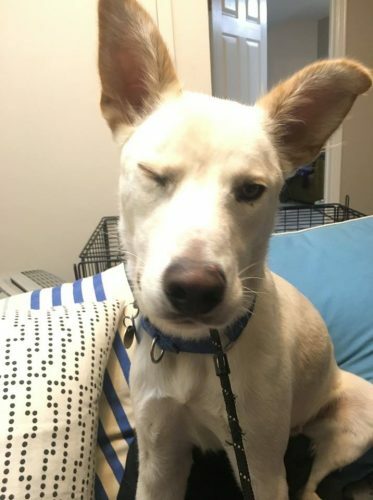 He will still need a strong furever human, who isn’t afraid to be the leader, especially during the beginning. 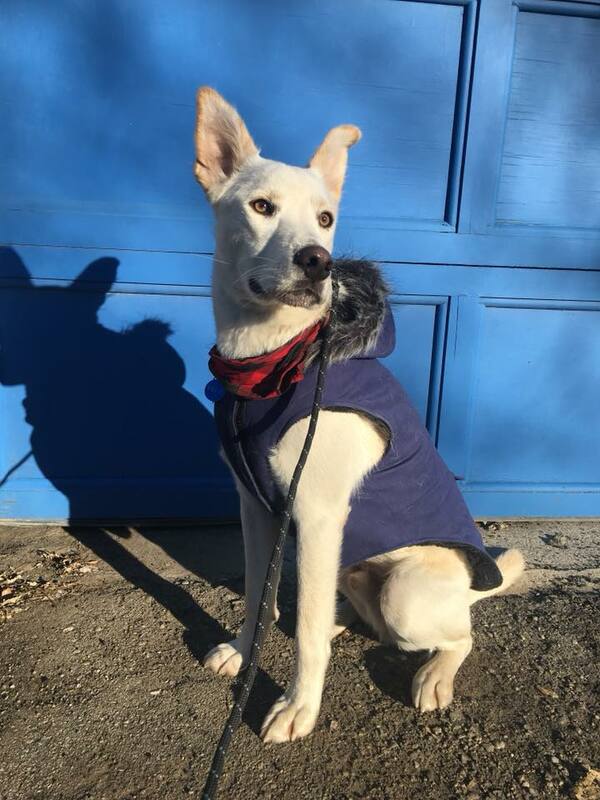 As an outdoorsy person, I think Dill would make an AMAZING adventure dog and would love trails and camping, and would thrive with a high energy, active human.